Mother Nature takes care of the cooling process. Cary Kirkmeyer and Jeff Klafka attended their first club meeting in December. They invited anyone who was interested to attend one of their brewings December 30th. I decided to take them up on their offer. I was very glad I did, made for an interesting night and I got some great photos. Every Wednesday and Saturday night Kirkmeyer and Klafka are at Klafka's barn either brewing beer or sampling it. I was at the barn for brewing, the night before Jeff said he had a car in the barn with the transmission stripped down. It's a multi-purpose barn. When I got there, Cary and Jeff had their kettles and propane stands set up with all their ingredients ready. They boiled their water to sanitize their equipment, then the brewing process started. The grains being used in the brewing process. Cary had his recipe all written out. After getting their brewing water ready, Jeff and Cary got their grain bags ready for the two kettles. On one of the beams, Jeff has posted some of the dates when his dog, Josh, caught various rodents around the barn. "Josh Got His Mouse 11-26-2008", "Dec 10th Josh Got Rat XL." Fun stuff like that. It's all ambience. Adds to the brewing process right? Cary writes down the recipe for the beer in his brewing book. After getting the ingredients added to the kettles, it was just a matter of watching and waiting. A few different beers were sampled. boiling ingredients - the "beer volcano" as Cary calls it. All in all, a good time was had by all. After a little while, one of their friends showed up. Jason Sharpless is another home brewer who had some beers with him to sample. I really like the holiday ale he brought with him, very tasty. One of the interesting things I learned was that what happens in the barn... stays in the barn. Jeff and Cary nail cards to the wall with some of the interesting quotes that are said in the process of brewing and sampling beer. Unfortunately some of them really weren't appropriate for the blog I didn't think. I didn't want to post photos that might chase away any casual readers of the blog. Cary nails up a quote on the wall from his son Dexter. but it does sound good. With the boiling process done, it was time to cool the beer down. Mother nature is handy for this in the dead of winter. Jeff and Jason carried the kettles outside and mounded the snow around them and waited. That makes the Redneck Brewing Club ecologically conscious, a good thing. While waiting for the beer to cool, more beer was sampled. The caps stack up as beers are sampled. a chance to get an early sip. After the beer cooled off, it was time to put them into jugs to finishing the brewing process. Jeff Klafka pulls one of the kettles out of the snow. 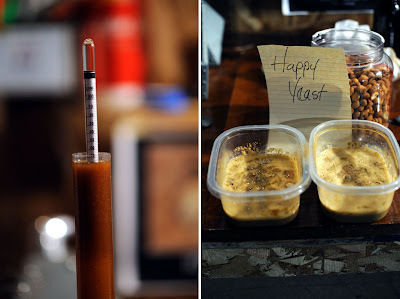 Finding specific gravity, happy yeast makes happy beer. One last thing. 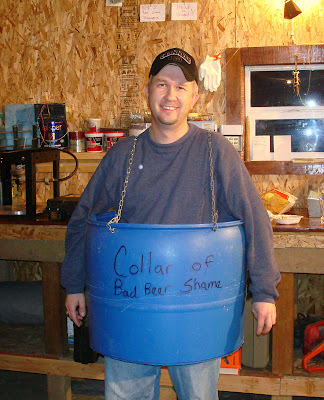 The Collar of Bad Beer Shame. Here's what I know. Jeff cut a plastic barrel in half to make a bottle washer. Jeff and Cary didn't know what to do with the other half of the barrel. Hence, the invention of the Collar of Shame. Not exactly sure how often it's been used though. This was more of an honorary thing, (I hope) I didn't do anything to embarrass myself. Not only do they have great pics and funny and fantastic stories. But the brew is awesome. Nice going guys. From Doc. Some of thos pics should be framed and hung as art!! Very cool! Some more labels for your entertainment.